(Blog by our Cousin Edie, at right. )“In September, I was in London visiting friends and family. 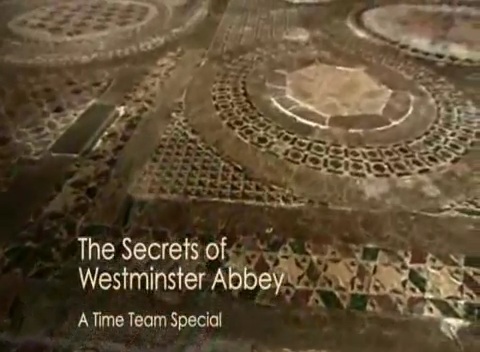 On my ‘to do list’ was visiting Westminster Abbey. 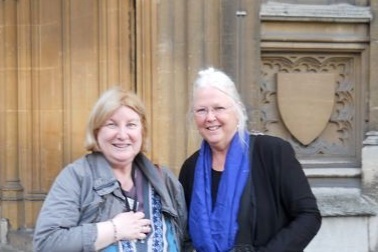 I spoke with my friend Elizabeth Sacks Chase, who is an official guide to the city of London, about our Wyatt ancestry and connection to the Abbey. As you know, the Abbey is dedicated to our relative through the Brooke line – King and Saint, Edward the Confessor, once considered the patron saint of England. Normally, the shrine of Edward the Confessor is not open to the public, but Elizabeth arranged with the office of The Dean and Chapter, for us to have a private tour of the shrine. I wrote a ‘letter of introduction’ explaining our ancestral connection to the royal line through Sir Thomas Wyatt and Elizabeth Brooke. It was moving to visit the shrine, which is at the heart of the cathedral. In the past, pilgrims would kneel in the alcoves of the shrine and pray, taking specks of gold from the shrine’s exterior as a momento. As noted below, pilgrims still gather every October in honor of Saint Edward. 13 October is an optional feast day for Edward the Confessor for the Catholic Church of England and Wales, and the Church of England’s calendar of saints designates it as a Lesser Festival. He is regarded as one of the patron saints of difficult marriages. Edward’s shrine is directly behind the high altar. Our guide opened a door from the shrine to the high alter, allowing us to see the Cosmati Pavement. We stepped down onto the stone around the pavement to get a close up view of this beautiful tile floor laid in the 13th century as part of the original building commissioned by King Henry III. I have included a link with the history of the Cosmati Pavement and it’s recent uncovering and restoration. Thanks for sharing Edie. I’m sure I’m not the only one who’s eating their heart out! You can also see the shrine by paying an extra three pounds and taking the Verger Tour instead of the regular tour. We did this when we were there in May and it was so worth the extra!